Apr 9, 2019—Hedley, BC: We’re so very excited to be returning to Sylix territory for the 6th annual IndigenEYEZ Youth Camp, July 14th – 21st! Registration is now open! 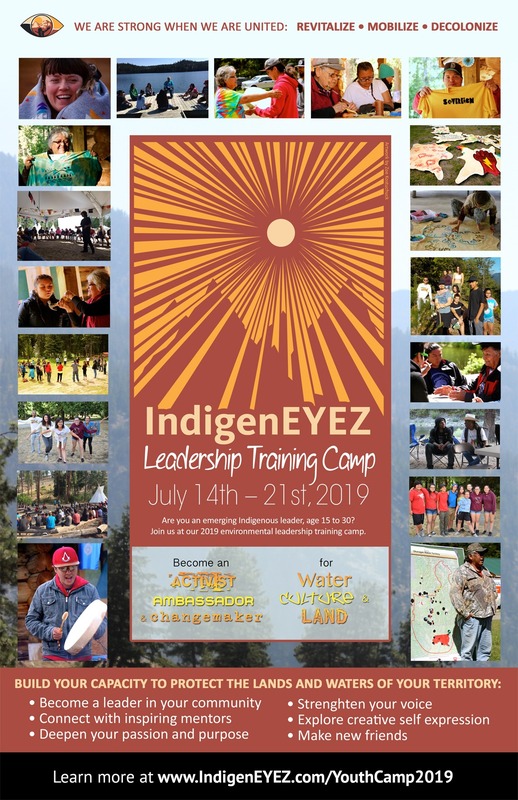 Evolved from previous years, the goal of the 2019 IndigenEYEZ Leadership Training Camp is to support our emerging leaders, ages 15 to 30, to become healthy & impactful change makers, activists and ambassadors for our land and water. This 7-day on-the-land training camp is for Indigenous youth and mentors who want to strengthen their skills in delivering their own workshops on climate change, water stewardship, and land advocacy in their own community. Seats are limited! Don’t miss out on this life-changing experience! In this gorgeous natural settings you’ll fill your days with fun, friendship, and discovery. Introverts and extroverts are equally welcome!